PyRF is an openly available, comprehensive development environment for wireless signal analysis. PyRF handles the low-level details of configuring a device, real-time data acquisition and signal processing, allowing you to concentrate on your analysis solutions. Hence, it enables rapid development of powerful applications that leverage the new generation of measurement-grade software-defined radio technology, such as ThinkRF Real-Time Spectrum Analysis Software. 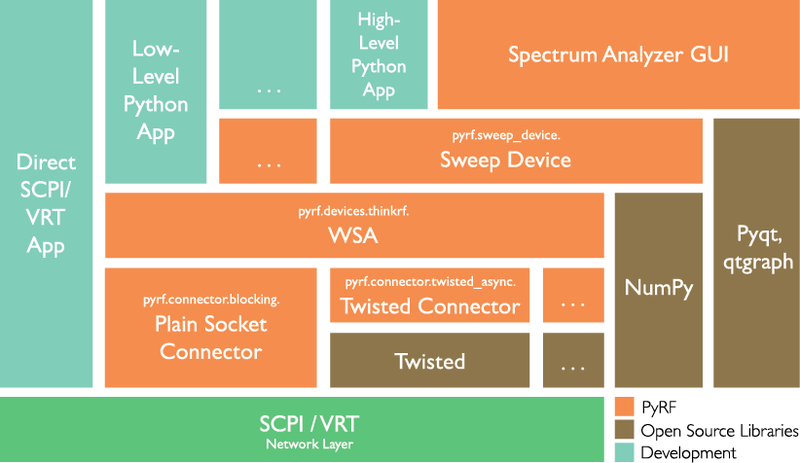 PyRF is built on the Python Programming Language (v2.7) and includes feature-rich libraries, examples including visualization applications and source code, all specific to the requirements of signal analysis. It is openly available, allowing commercialization of solutions through BSD open licensing and offering device independence via standard hardware APIs. © Copyright 2012-2018, ThinkRF Corporation Revision d675413e.